B.J. McKay and his best friend Bear. Every day is better than the last. And best of all I don’t pay property tax. Off to New Orleans or who knows where. I’m B.J. McKay and this is my best friend Bear. As 1970s fluff TV went this show may have been the fluffiest. Here’s how it goes. A good looking trucker, B.J. 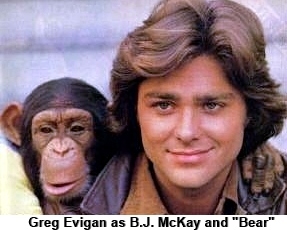 McKay (Greg Evigan) rides around the country helping out beautiful damsels in distress and avoiding corrupt law enforcement who seem to be everywhere (both the damsels and the bad cops). B.J. 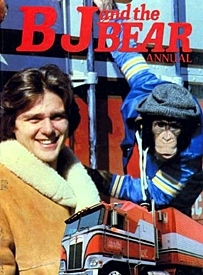 had a sidekick on these adventures, his co-pilot, and best friend, was a chimpanzee named Bear. The chimp was named Bear because his favorite hat was the same as the hat the famed football coach Bear Bryant wore. 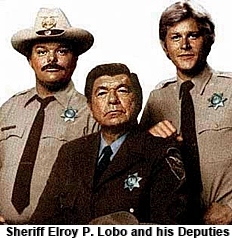 The show took off with such good ratings that during the first year a spin-off was created for Claude Akins’s character Sheriff Elroy P. Lobo. His show was called “The Misadventures of Sheriff Lobo” and ran for two seasons. In the final season B.J. has his own trucking firm called Bear Enterprises based in Los Angeles. He hires seven beautiful young women as his truckers and goes against a corrupt police special task force leader named Rutherford T. Grant (Murray Hamilton). Grant’s own daughter Cindy (Sherilyn Wolter) works with B.J. but that just intensifies the harassment. At the end of the 1981 season either the show just outlived its ratings or people decided that the seventies were over and it was canceled, not surprisingly Claude Akins spin-off was also canceled the same year. 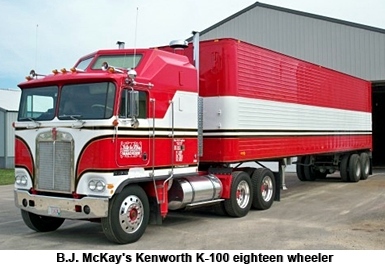 Although the show only ran from 1978 to 1981, the truck behind the show remains a show-stopper over 30 years later. It was found in Douglasville, GA, in 2007 by a father and son, rusted and in bad shape. They hauled it back to Wisconsin and totally took it apart, fixing or replacing parts as they rebuilt it. It now looks just like it did in it’s Hollywood glory days and travels around to truck shows and rallies. Oh, they also have a stuffed chimp doll, just for fun on the road!